In a red USC sweatshirt (who said I was ready to leave?!) 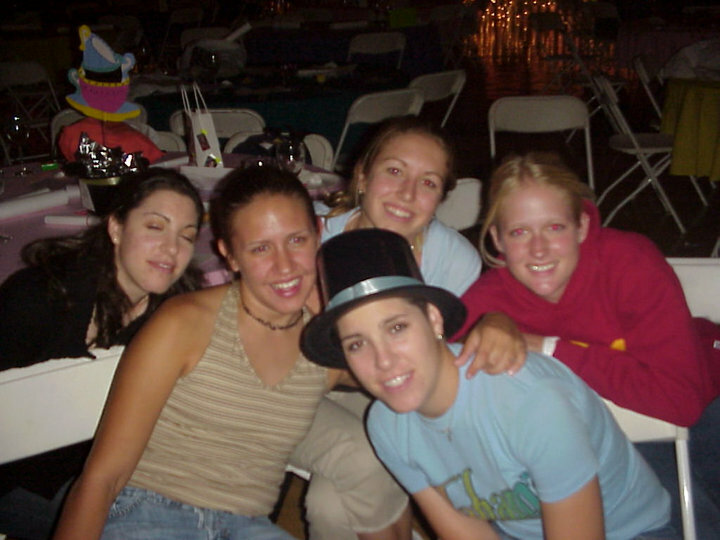 c. 2002, with four of my best friends at our high school graduation party. Anymore, I’m afraid to say it. When I’m meeting a person for the first time, I feel I have to open up the hometown discussion with a caveat: I’m from Tucson, Arizona — but it’s not like you think. What’s the Matter with Arizona? The State Americans Love to Hate, as this week’s Economist put it. Or John Stewart summing it up as only he can (a “nuclear waste dump”). And I don’t blame them. Let me count the ways Arizona is looking like a holdout for extremist nut jobs. There’s the 2011 shooting of Gabrielle Giffords (gun nuts). This month’s separate-but-equal style anti-gay law that would have permitted businesses to ban gays on religious grounds, passed by the state legislature and finally vetoed at the last minute by Governor Brewer (bigots). The 2010 immigration law legislators enacted but was later shut down by the Supreme Court that would have allowed law enforcement to racially profile people (in this case, mostly Hispanics) and literally pull over cars that they thought might contain illegal immigrants, then detain people without papers (racists). And the newest anti-abortion bill that congress took up just after the anti-gay bill failed, which would remove the warrant currently required for the Department of Health and Human Services to search abortion clinics (women-hating). Yeah, Arizona is not looking very open-minded these days. The problem is, I spent a good 14 years of my childhood in Arizona. And while I can’t say I love the place (I high-tailed it out as soon as I graduated a high school I admittedly hated for LA, and then even more liberal Paris and finally NYC), it pains me to see the state in this light. Because it just wasn’t my experience growing up. 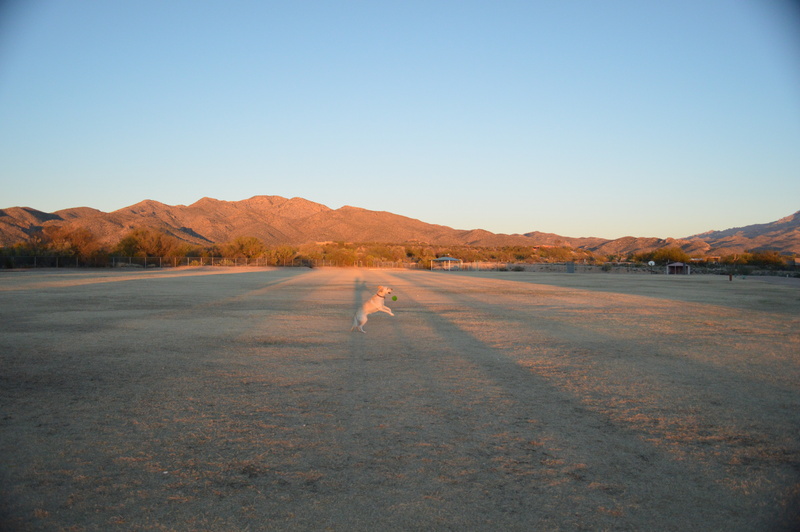 My parent’s dog fetching with another gorgeous pre-sunset Arizona sky. More admittedly apparent is the separation of races. There were the middle-to-upper class areas — where the houses sit on acres and there are fancy plein-air shopping centers and yoga studios and high-end Mexican restaurants and Starbucks every five blocks — and there you’ll definitely see more whites than any other race. And then there’s the lower-middle-class-to-poor downtown area — where the houses are packed into small streets and gunshots are part of the soundtrack of the night (my dad, an engineer, told me of one project in a particularly bad neighborhood, where he had to design a special bulletproof streetlight because gang members would shoot out the bulbs and then sometimes each other so they could do their business in the dark) — where you’ll definitely see more Hispanics than whites. But in my high school experience, while there were more Caucasians than Hispanics, the races seemed to get along fine. What’s more, unfortunately this separation happens everywhere. It happens in New York, where — even though it’s a wonderfully diverse city — a good portion of races leave Manhattan for home in the boroughs every weeknight (the island is filled with obscenely rich white folk who are the 1% of the 1%). Oh yeah, and then there’s that stop-and-frisk law which basically legalized racial profiling and was part of the city’s infrastructure for years. It happens in Paris too, where I taught English in the suburbs for a year after college (in the same area where, just a year before, protestors burned cars in the streets due to a case of racial profiling). As soon as you’re in the suburbs, in many areas you quickly go from white and wealthy with a long lineage of French ancestors to black and impoverished often Muslim from formerly colonized North African countries. In France too, there have been many attempts at anti-immigration laws, and even a controversial law banning Muslim headscarfs in schools. None of this is something to proud of, but it’s a reality. We can only hope that with the Internet allowing us all to see everything going on around the world, maybe our eyes are being slowly opened…and someday we’re heading toward a more colorblind society. Back to my original point. Arizona: It’s unfair to classify a whole state (and anyone who comes from it) as a bunch of gun-slinging bigots. Tucson, at least, is a relatively liberal (or at least libertarian) city. I have friends who are working as pro-immigration lawyers, friends who are artists and Democrats and open-minded. I hope that they will continue to fight against the ridiculous laws frustrated conservative groups are peddling and the intimidated legislators who let them have their way. And I just hope the rest of the country can keep their minds open too and not pigeonhole an entire state because of the horrendous things happening on the fringe. The $64,000 Question: What to Do with Wages? Everyone’s talking wages these days. Must be holiday spirit in the air. At the same time, in San Francisco, BART train drivers are striking for a raise from their $70K-a-year salary (including full benefits)…because it’s not enough to buy a home and support a family of four in the Bay Area. And Switzerland is getting teed up to vote on “incomes for all” – a guaranteed wage for all residents, whether they work or not. Fans say it would replace welfare payments (and increase added value tax – what you pay on purchases – by only 20 to 30 percent…a bargain!). All of this fringe noise reminds me of the mockingbirds at our home in Arizona: They wanted to get out of the heat into our cool home, so they slammed their beaks into our door frames and windows. Over and over again. Yep, that really worked well. On the outside, trying to get in, using crazy outlier tactics. Still, $15-an-hour or more than $70K a year seems a bit high to me. Granted, the cost of living in NY or SF is two to three times most other cities — but what the SF BART peeps are demanding (and the fast food workers) is more than I or a lot of my college-graduate friends got paid in those same cities for their first jobs out of school. And we made it work. As my SF friend put it, $70K might not be enough to support a family in a single-earner household…but what’s the other parent doing? Not working. Time to get a job! Between two it ought to be enough (especially if you’ve got benefits!!) to support your family. And buying a home? Maybe it’s time to rent like the rest of us. As for the Swiss: I’m pretty far left, but they’re talking straight-up communist. And we all know where that goes: threats of war via fax. On the other hand, in the past 10+ years the federal minimum wage just isn’t keeping up with inflation. When McDonald’s CEO is making $13.8 million a year but his employees, at an average of about $8 per hour, can’t even live paycheck to paycheck — something’s smelling greasy. What to do? Get the smarties involved! Instead of politicians (who get paid 6 figures a year…you can bet most of them don’t understand paycheck-to-paycheck) bickering about something that’s way too complicated and outside of their expertise, why not throw a bunch of geeky economics professors in a room. Have them look at the cost of living, current wages, and incomes of each company. And figure out what would be the best outcome for everyone. (It should depend on location too – while $7-an-hour might be more than enough to start a 401K in Nebraska, it sure doesn’t pay the cable bill if you’re living in New York City.) Chances are by raising the wage enough so even the lowest-paid workers can afford to buy fresh fruits and veggies instead of Frito-Lay for dinner, the guys with the golden parachutes could still take their annual spring vacation to Paris. Is that such a crazy idea?